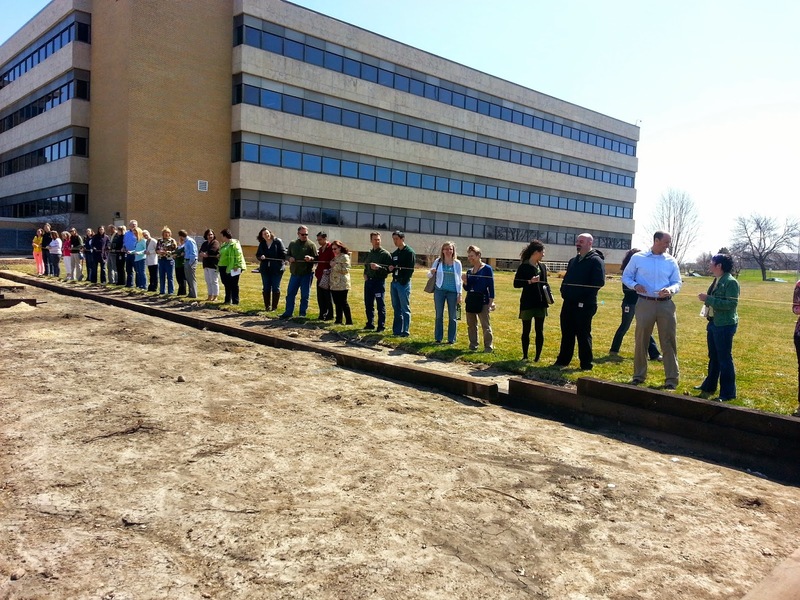 I had the honor and privilege of attending the grand opening ceremony for the CUNA Mutual Group employee community garden on Earth Day, 2014. A couple of years ago, a few very enthusiastic employees from CUNA Mutual visited our employee community garden at American Family Insurance. They wanted to know what we did to get ours started, and we were able to lend them technical support such as our guidelines, protocols and other resources. So when the CUNA community gardens were scheduled to have a grand opening on the 2014 Earth Day, I immediately responded to the invitation with an enthusiastic "yes." CUNA Mutual has a large campus with many buildings, but is largely land locked in an urban setting on Madison's west side. That didn't stop this group of enthusiastic employees. The proposed putting a community garden on top of the parking deck, which already had a large lawn. In fact, while I was up there, I remarked myself that you would never know we were standing on top of a parking ramp. In order to overcome the thin layer of soil that was originally only meant to support grass, they are installing raised beds to add some more depth for eager vegetable plant roots. My understanding is they are going to have 40 10 x 10' garden beds. They will also build a couple of accessible garden beds, which are raised higher and have ample access to all sides for someone in a wheelchair. I was greeted at the front door by Candace and a few other employees I have met along the way. We walked out to the garden area where many of the employee garden participants were waiting in the bright April sunshine. Jesse Lerner from executive director of Sustain Dane, spoke about the importance of community gardens for employee health and well-being, and as an employee benefit. She also mentioned that as far she knew, this was the first rooftop employee community garden. In honor of Earth Day, the CUNA Mutual employees were able to purchase a sticker that allowed them to wear blue jeans on a normally business casual workday. One of the employee representatives announced that $1,700 raised from the sticker sales would be donated to the Lussier Community Education Center. Additionally, there will be two garden plots dedicated to producing food for the community center, and all employees are being asked to donate 10% of their own plot produced to the community center. After taking a photo of the enthusiastic gardeners, I was asked to participate in a photo of people who supported the community garden project. It was great to be among my gardening peeps. The garden is slated to be finished and ready for planting by mid to late May.